Recently, Hull, my glorious home town, was awarded the City Of Culture 2017. Laugh, sneer or applaud; I couldn’t care less. Whilst dwelling on this new accolade, inspiration for a FashionBeans feature came thick and fast as I looked into Hull’s fine heritage. As a once booming port, I was reminded of a gentleman that harked back to this golden age – an age where a man would face the high seas, overcome the fickle force of nature and bang a headboard into oblivion during shore leave – the humble fisherman. The hunter gatherer and outdoor expeditionary are both strong looks this season and the heritage fisherman is undoubtedly of the same ilk. Timeless, traditional and sharp (three words that are always welcomed by FashionBeans), feel free to mix and match the rural aesthetic to your heart’s content. Simple masculinity has never been so attainable and the choices are endless. 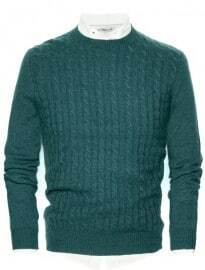 Undoubtedly the quintessential piece of the fisherman, cable knit jumpers and cardigans are not only on trend but ooze character and charm too. Thankfully, my grandma is quite the boss at whipping up a cable special but if you want one fast, there are an abundance of choices at both high street and designer price points. With such variation available, there’s more than one route to sartorial success. Keeping things timeless and traditional is always a good move. Regular fits, standard cable pattering and muted colours (think ecru, grey and navy) are every inch the classic trawlerman and make for a relaxed yet composed winter look. Don’t worry too much about introducing a shirt either. Plenty of dock workers in the 1930s went without, but a plain Oxford version could provide an understated edge with the collar tucked neatly away. Exercise caution with your layers though – cable knits are notoriously itchy so opt for something underneath with enough thickness to protect. Nobody wants to be scratching and uncomfortable all day. If you prefer a more contemporary slant on classic apparel, never fear – there’s a further style avenue to explore. Bold, rich shades of burgundy, emerald green and orange all provide an injection of welcome winter colour in a sea of grey, and to make things even better, they’re all currently huge trends. Opting for a larger size or slouchy cut can also help create an interesting silhouette and maximise comfort. Personally, I’m a huge fan of an oversized burnt orange knit and black skinny jeans combination. Easy, vibrant and original – what’s not to love? The double-breasted pea coat is a perfect choice for the quintessential high seas look. Although its heritage is linked to the Navy rather than the fisherman, it’s still a classic design and the epitome of masculinity. Spending a bit more on some strong winter armour is most definitely worth it: the silhouette has been a menswear staple for decades and if you focus on craftsmanship it’ll last season after season, ensuring you get your money’s worth. Whether you button up or wear open, nothing shouts fisherman more than an oversized lapel and wool blend fabric. The devil really is in the detail, too: plenty of buttons and accents on current designs make reference to the ocean with embossed anchors, fisherman knots and seashells – giving off a nautical feel without needing to resort to ‘obvious’ Breton stripes. A more contemporary approach to outerwear is also more than applicable. Outdoor specialists such as Berghaus, Musto and Henri Lloyd all produce technical, waterproof jackets that blend classic design with high performance to strike the perfect balance between fashion and function. Win win. Another benefit is the colours available; unlike the pea coat, outdoor/sailing jackets come in bold shades like orange, blue, yellow and green, enabling you to make a real statement and separate your look from the crowd. For too long, us gents have mirrored dreary weather with even drearier shades but things are about to change – read our guide to incorporating winter colours and embrace it this season. During winter, it’s far too easy to settle into an ocean of monochrome – inoffensive greys, stalwart navy and neutral (but incredibly predictable) browns. This is one of the biggest strengths of the fisherman aesthetic; bold primary hues can complement even the blandest of looks and injecting a pop of colour is a sure-fire way to sartorial success. Bright yellow is the most obvious hue to consider and in many opinions, the strongest. Bold enough to overpower mustard and lemon yet nowhere near the realm of fluoro (not now, not then, not ever) – a warm hue is perfect in every way. Integrating a primary-coloured cable knit within a relatively low-key outfit is the most effortless way to make a statement, yet traditional winter layering – a bold t-shirt under a shirt under a knit – offers a more subtle approach. If colour isn’t your thing, a small accent via buttons or accessories can add a point of interest and touch of individuality to an otherwise plain ensemble. In terms of palette, consider shades like Azure, turquoise and emerald – the vivid colours of the ocean are all more than applicable. This really is a no-brainer – the fitted beanie is intrinsic to the fisherman aesthetic and, indeed, a direct result of its prominence. A fold-over base and waffle knit design adds texture without going overboard. Loose-fitting ‘Noddy does fresher’s week’ oversized slouch hats aren’t (and never were) considered examples of good style. However, once again there’s much flexibility when it comes to colour, so feel free to experiment. Fingerless gloves offer hand protection and still let you smoke/use a smartphone/zip stuff easily, so rest assured: all your First World problems will remain at bay. When it comes to colour, though, neutral is usually the only acceptable choice. Unlike other fisherman-friendly pieces, bright shades can often jar and appear slightly clown-like. In terms of footwear, siped and rubber-tread boots were perfect for slippery trawler decks and are now perfect for AW13, where they will ensure you remain sure-footed, no matter what the weather. There you have it, a comprehensive guide to dressing like the quintessential fisherman. Cable knits and quality wool blends are key, but as returning seasonal frontrunners, you’ll be able to source the perfect piece. Combine this with modern colour and it’s the height of rugged outdoor masculinity, fit to sail the Seven Sartorial Seas. You might not have hauled a net full of halibut, but at least you can look the part (minus the overwhelming stench). So, what do you think to our fisherman-inspired pieces and looks? Are there any other topics/areas of interest you would like to see us draw style inspiration from in the future?